When we think about things that require effort, we usually don't even bother to include something like "me time." Because hey, me time means relaxing with a bottle of beer in a hammock--or, if you envy the beer its bed, then in a hammock with a beer. Or it means plunking down in front of the tv to watch a couple of tv shows. Or curling up in bed on a Saturday morning for hours and not coming out until you absolutely can't resist your empty stomach any longer. Right? What if our concept of me time were more expansive though? Think about it. French fries are easy to eat, and I like them A LOT, but I know perfectly well that a diet consisting solely of French fries is not much of a diet. I would be unhealthy and unhappy. Resisting "easy" and eating something homemade that's equally delicious and much healthier is going to be a lot better for me in the long run. I'll feel better physically, and I'll feel better mentally, because I know that I'm making good choices. Likewise, it's easy for me to curl up in bed and watch something on Netflix. And sometimes I really do need to unwind, and that's a great way to do it. But often when I do that it's really because it's just easier than something I care more about, like reading David Graeber's 500+ page tome on debt. I come home from work, and I'm tired. I just want to make my dinner and then float on the edge of my post-work weariness until I can convince myself to go to sleep. Whatever happens between food and sleep should require as little thought as possible. How much better do I feel though, when I'm actually putting forth the effort to do the things that I actually care about? the things that I want to identify with—not as "girl who watches Netflix" but as "girl who loves to learn"? I've watched coworkers do this thing where they go home every night after work and just spend hours upon hours watching television. Okay, I haven't literally watched them do that. I'm not outside in the bushes or anything, but I have listened to them talk about tv shows and movies. Just think about the amount of time the average person has to put in to be conversant in the details of everything from Breaking Bad to Parks and Recreation to Madam Secretary to South Park. Seriously. I've binge-watched television shows before (and usually I go for the real doozies, the BBC productions or the HBO series that are a minimum of one hour per episode), and I know how astonishingly fast you can vacuum up 30-40 hours of your life on one show. But I was reminded recently that "easy" isn't always "good," and that when we let easy choose our lives for us, we frequently find ourselves in a situation where we've given up so much more than we realize. Hence, that one guy will tell you how much he loves to play guitar and how he'd really like to devote more time to music, and it's not that he doesn't have the time to give, it's just that there are easier things to do, and then it's 10 years down the road, and he could have been so much better at playing, but he didn't put in the effortful hours of dedication. It takes effort to actually care for yourself. It takes effort to go beyond identifying what makes you feel fulfilled to actually doing it: on a day-to-day basis, when you're tired after a long and mind-numbing day at work, amidst so many easy distractions that require half the focus and work. But just like I don't really want to eat French fries for every meal, so too, I don't see myself being very happy if I pick easy over effort. 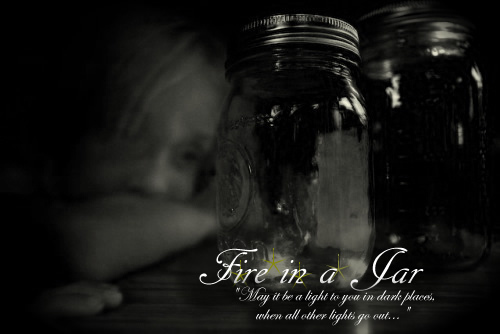 I meant to conclude there, so it's a bit of a tangent to mention it, but this blog has two names, "Fire in a Jar" and "At the Wicket Gate." I meant the latter to be more of a subtitle or a description, but the two have distinct origins, and so I find it a bit difficult to subordinate one to the other. Anyway, "At the Wicket Gate" is an allusion to Bunyan's novel, The Pilgrim's Progress. The entry to the straight and narrow path is a wicket gate, and when I first started this blog, I was 18 and feeling like I was setting out on that big journey into adulthood, with whatever trials, travails, blessings, and laughter it might hold. I guess I just wanted to say with that, that there are two options that Christian has. The broad and easy path that leads to destruction, and the straight and narrow path, with all its stones and its hills, but oh, it leads further up and further in, as Aslan put it in a different book. The thing about those options, though, is that they're never that far apart. In a sense, we're always "at the wicket gate," always choosing a particular path, though our choice may vary from one moment to the next. It's an always, ongoing commitment that we make when we choose a particular way, and while the discipline of a stretch may make us doughty road warriors, it takes little more than the empty circus festivities of Vanity Fair to turn us aside. Pride, therefore, has no place in it, but likewise neither does despair. Just as Vanity Fair is nigh unto the path and easily turns us aside, so the path leads away from it, and all we have to do is make the choice. Because every evening of my life is an incremental step in the arc of my story. That's why it matters. Even when it feels like it doesn't. Even when I don't want to feel like it does. Further up and further in. My first conversion moment was when I read a book by C.H. Spurgeon called "At the Wicket Gate". I was 15. It opened my eyes. And you keep calling to conversion on this blog.